I went for one run after work, solo, no pack, beeps or kit. Ipod and tunes. In the lift I met curent Freeride World Tour leader Drew Tabke, competitor Kevin O’Meara and Chamonix locals Dave Searle and Davide de Masi. A 10 turn warm up took us to the pillow field of justice. A 100 foot vertical drop over a ten pillow at roughly 60 degrees. Time to send. Shame I just had a phone camera and not the 5d but the rest of the fast skiing made me glad not to have the weight with me. 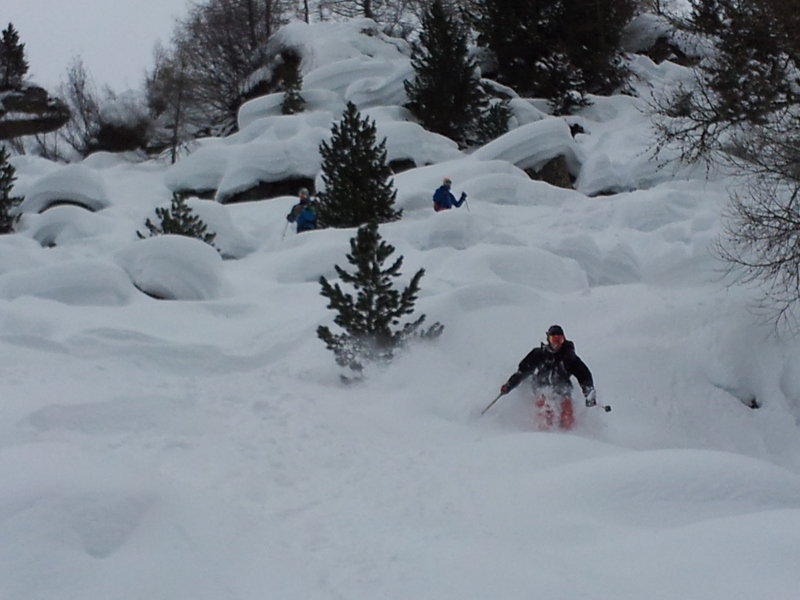 With all the big mountain skiing I do nowadays, always keeping in control, I’d forgotten how much fun it is to go fast. Drew Tabke on a fall line sending mission. This entry was posted in Skiing and tagged パウダースノー, フリーライド, beau, Chamonix, 粉, Dave Searle, Davide de Masi, Drew Tabke, вне трасс, катание на лыжах, порошок, Elevators, 雪, France, Freeride, Freeride World Tour, Hors Piste, Kevin O'Meara, Montagne, Mountains, neige, neve, снег, Offpiste, Pillow lines, Pillows, Plan de l'Aiguille, polvere, Poudreuse, Pow, Pulverschnee, Samsung Galaxy S3 photo, Skiing, snow, 关闭滑雪道, 山, 山地, 滑雪 by Ross Hewitt - Skiing, Climbing, Photography. Bookmark the permalink.